One of the great rounds in Davis Cup was so good, it needed an extra day. Because of the longest singles in Davis Cup history time-wise (and the second longest by games), the Argentina-Brazil tie in Buenos Aires couldn’t finish on Sunday before it became too dark. So the only outdoor tie of the first round resumed on Monday, with Argentina leading for the first time. In what little daylight was left, Federico Delbonis won a set from Thomaz Bellucci. Entry was free on Monday into the Tecnopolis, the venue with the futuristic name but an olde worlde feel. Bellucci beat Delbonis in their two most recent matches on tour, but the capacity, partisan crowd made the Brazilian feel like he was in the lion’s den, and he was dinner. 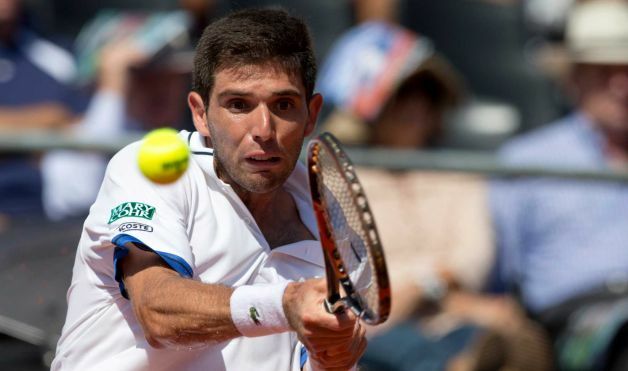 Bellucci won the second set, the first set of the day, to make things interesting, but nerves set in and Delbonis won 6-3, 3-6, 6-2, 7-5 for Argentina to triumph 3-2. Argentina’s reward for remaining unbeaten against Brazil for 40 years, was a home quarterfinal against title favourite Serbia from July 17-19, two weeks after Wimbledon. The other quarterfinals are: Britain hosting France, Australia welcoming Kazakhstan, and Belgium at home to Canada. Those ties will have some way to compete with a surreal weekend full of epic matches. There were 13 rubber which went to five sets, and four of them won from 0-2 down. 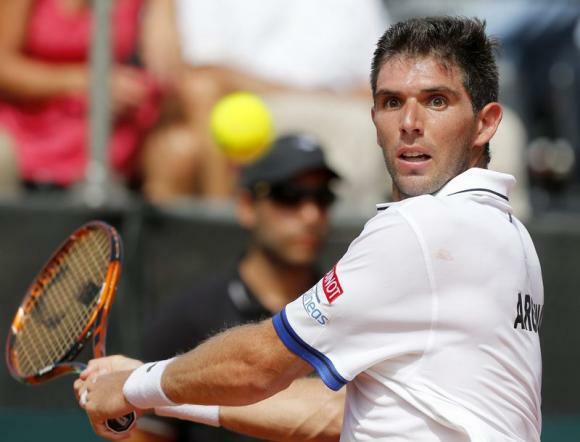 In Buenos Aires, Argentina’s Leonardo Mayer and Brazil’s Joao Souza thrilled for a record 6 hours, 43 minutes in high temperatures. Mayer won the first two sets 7-6 (4), 7-6 (5). Souza won the next two 7-5, 7-5. In the fifth, both needed massages between games, and struggled to hold serve amid high tension. Mayer finally prevailed 15-13 on his 11th match point, then needed treatment for dehydration. Souza, who also won a five-hour, five-setter on Friday, also suffered from cramps. In Glasgow, Andy Murray spearheaded Britain’s 3-2 win over the United States, but the key win was by James Ward, a so-so player on tour but Superman in the cup. Ranked 111, Ward came from two sets down to beat 20th-ranked John Isner 15-13 in the fifth, after almost five hours on Friday. In Astana, Kazakhstan forced a decider against a strong Italy lineup. The Kazakhs surprisingly picked Aleksandr Nedovyesov, whose only previous cup singles was 10 years ago, a loss. Ranked 130, he was pitted against the 22nd-ranked Fabio Fognini, who beat Rafael Nadal on clay just over two weeks ago. To the disbelief of his own team, Nedovyesov won 7-6 (5), 3-6, 4-6, 6-3, 7-5, and his teammates threw him in the air. In Vancouver, No. 4-ranked Kei Nishikori pipped No. 6 Milos Raonic 3-6, 6-3, 6-4, 2-6, 6-4 in another typically tight match between them, to leave their No. 2s to settle the outcome. Canada went with hometown player Vasek Pospisil for a third straight day, and he was still going strong as he put away Go Soeda 7-5, 6-3, 6-4 for Canada to beat Japan for the first time. The Britain-France tie is the pick of the quarterfinals, and despite common sense saying Britain should pick a grass court for former Wimbledon champion Murray, it doesn’t look like any of the suitable grass venues will be available or ready. Britain could go back to Glasgow, which hummed for Murray and the team, and could inspire a first win over France since 1978. France’s chances will depend on its team. Gilles Simon, Gael Monfils, Julien Benneteau and Nicolas Mahut, on debut, were too good for Germany in Frankfurt for an eighth successive tie going back more than 60 years. Against Britain, France would again look too strong if Jo-Wilfried Tsonga and Richard Gasquet, two of the main architects in last year’s run to the final, were injury-free and available. The title still looks like Serbia’s to lose, a fact it underlined in handing Croatia its first 5-0 whitewash in 12 years. World No. 1 Novak Djokovic, who won the Davis Cup in 2010 and led Serbia to the final in 2013, skipped it last year but has recommitted. The team also has back Viktor Troicki, who returned from suspension last year for refusing a blood test in 2013. In Troicki’s first cup action in two years, he came from two sets and a break down to beat Borna Coric, who downed Andy Murray recently on tour. Together with world-class doubles specialist Nenad Zimonkic, Serbia is formidable. Australia eased into its first quarterfinals since 2006 in Ostrava, where a Czech Republic team without stalwarts Tomas Berdych (unavailable) and Radek Stepanek (injured) was outclassed. The Aussies have Bernard Tomic, who improved to 14-2 in cup action, and the retiring Lleyton Hewitt, and face a close tie with Kazakhstan. The Belgians should struggle against Canada. They barely got past Switzerland, who’s title defence was always going to be brief when Roger Federer and Stan Wawrinka decided not to play this year. But then the unheralded Henri Laaksonen produced two stunning five-set wins, and Belgium had to call up 21st-ranked David Goffin, who missed the first two days played with back pain, to finish off the plucky Swiss 3-2.